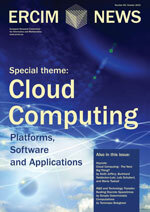 In 2009 the EC DG Information Society and Media, Software and Services convened an expert group on CLOUD Computing, moderated by Burkhard Neidecker-Lutz of SAP Research and Keith Jeffery of ERCIM, with Lutz Schubert of HLRS as rapporteur and Maria Tsakali as the responsible EC official. The report surveys the current situation of CLOUDs being used both privately within an organisation and as a service external to an organisation. It characterises different kinds of CLOUDs (both existing and future) leading to a list of open research issues that need to be addressed. From left: Burkhard Neidecker-Lutz, Keith Jeffery, Maria Tsakali and Lutz Schubert.